Peyton is 18 months old! I don’t really know what to write because everything is pretty much the same as it was last month. We haven’t been to the doctor yet, so I don’t know her stats. She is a talking machine. The other day we were watching Cars, and of course she chose to repeat the word “idiot”. She hasn’t said it again though. I love when she says, “there ya go”. We always tell her that when she is trying to do something, and figures it out. When she needs my help and I finish the task she always says, “there ya go” in a proud voice. I also love the way she says bear because it sounds like she is from Boston. She always wants to take her bear, bunny, and giraffe to bed with her. Yesterday Elmo was thrown in to the mix of “friends” in the crib. Last night it took her like an hour to fall asleep, she was singing “lalalalala Elmo’s world”. She will talk to them forever in the morning, and before nap time. The other day I went in to her room and she had all her stuffed animals lined up and she was “reading” a book out loud. I’m not sure if she was reading to them or if she had lined them up earlier and then decided to read. She’s definitely getting more imaginative in play though. 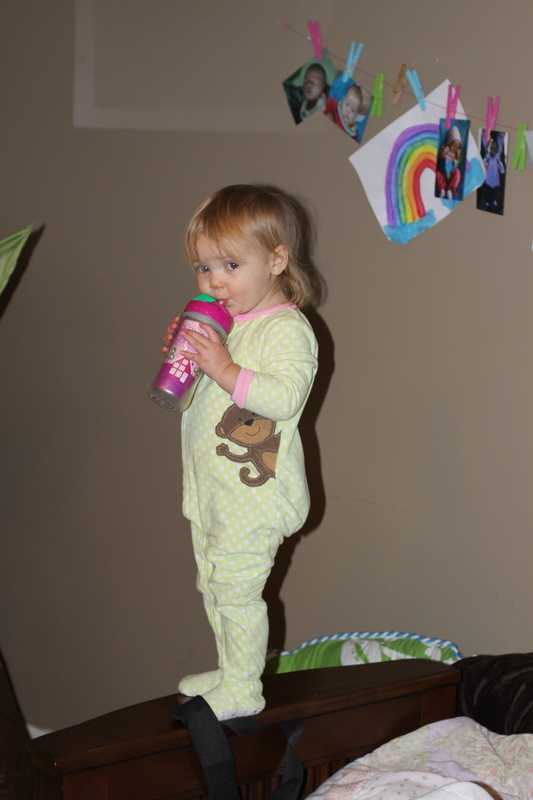 Her favorite things to do right now are paint, and climb on the couch… or climb on anything she can. 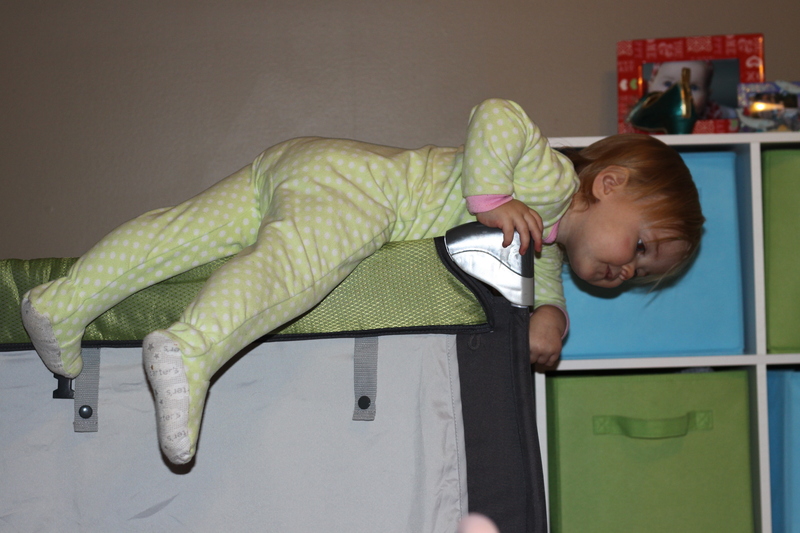 Yesterday morning she slung her leg over the crib and started to pull herself up. 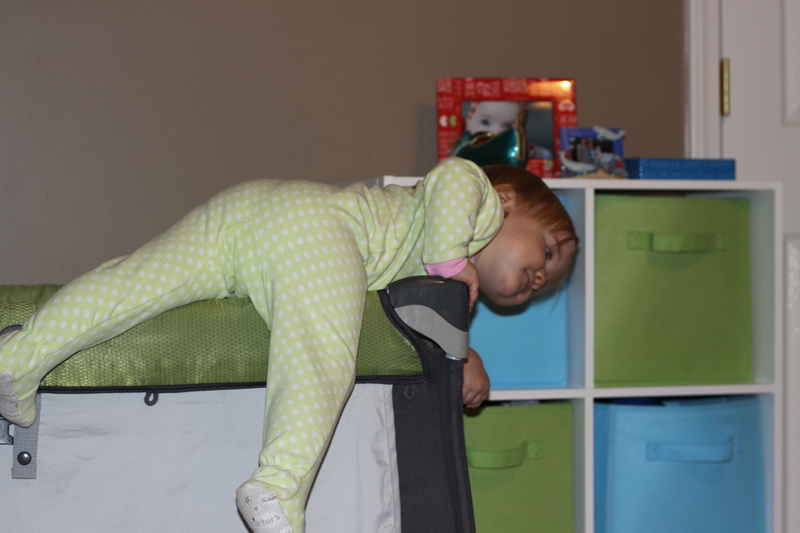 Once she realized she was getting on the top of the crib she put her leg down. I think she was a little scared. ha. Hopefully she doesn’t try again because I’m not ready to put her in a big girl bed. Oh, and of course watching movies. She’ll bring me dvds all day long. I think she thinks I’m telling her no because of I don’t like the movies she’s picked out. I’ve been trying to get her to repeat “yes, mommy” when I ask her to do something. She finally started saying it, and it’s so adorable. The only problem is that she won’t do the thing I asked. ha. We’re working on it. When she gets really mad at me she will hit something she is close to, and look at me with a “did you see what you made me do” look on her face. Or she’ll throw something in the air, it’s usually a dvd. This usually only happens right after her nap, and before she’s had a snack. She knows the colors yellow, blue, purple, and sometimes red, pink, white and green. She tries to count, and most of the time it goes a little something like this “2,3,2, 6,7,9,10” But if we do every other number she can count to ten, but always leaves out 8. She knows her shapes really well, but octagon is her default shape. If I ask her about a shape and she doesn’t know it she’ll say octagon. I love when points out the different shapes she sees when we are out and about. Whenever she sees an “A” she always calls it a triangle. She is still a super picky eater, and will not try anything new. I had to shove cake in her mouth because she wouldn’t try it. ha. Whenever we go to Publix she gets a free cookie from the bakery, and she always licks it first. She is a very slow cookie eating, and usually doesn’t finish it. I think that about sums her up right now. I might take her 18 month pictures this weekend. It’s so stinking cold though. 😦 Last year she wore a short sleeved shirt in her 6 month pictures. 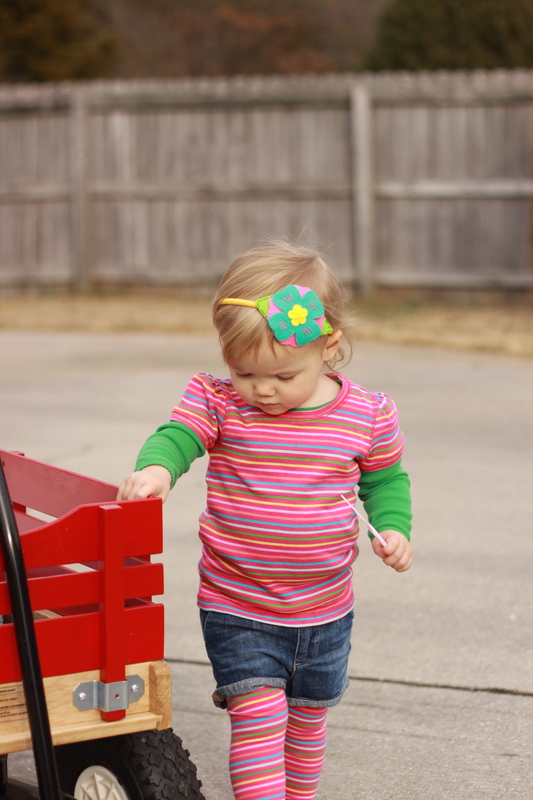 Pushing her wagon a few days ago. This morning, standing on the “arm” of the futon. Actually she wasn’t just standing, she was walking across it. I took her down a few times before I went and got the camera. I have a feeling this is going to be our new battle ground. I thought she was safe in the pnp. she is smart. i like that she climbs, throws dvds, and licks her food. also that you shove cake in her mouth. hahaha! I can’t stop laughing, at the mental picture I’m getting of me shoving cake in her mouth even though it was nothing like that. She looks so cute. I love the look on her face in the picture of her standing on the futon, like “Haha Mom, try and stop me now, sucka.” Also, your daughter is very advanced. I know this because her default shape is a freakin’ octagon. Most kids would say something simple, like circle. I think you should make a video of her talking. I have a couple of videos on our video camera. I need to put them on our computer, so I can post them. I agree with Krista, your baby makes my baby look “Special” and not in a good way lol. Picky eating, that’s one thing I am so grateful for that Jordan isn’t. Which can also be bad if she tried to eat something bad like dirt…or poop, but she hasn’t lol. She is however picky about what she’s drinking, just milk and water. LOL, Ashley. That’s funny. She’s just very verbal. 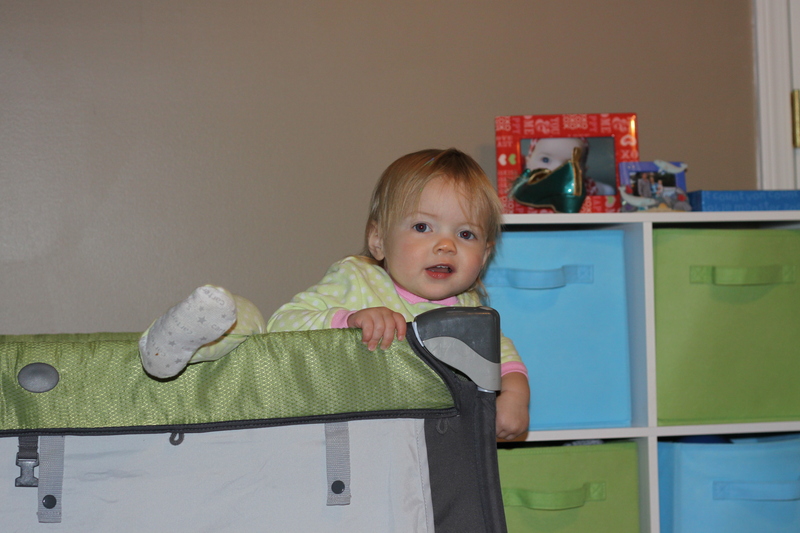 I thought we would have a while before we needed a big girl bed because she’s never really been a climber, but man, the last few days have been crazy. For now we have the crib turned around so the lower part is against the wall. That’s smart, I think Jordan’s never tried climbing out because she’s not tall enough to. The Doc says she’s really small for her age in height and weight. Peyton is really tall! I wanna see more photo shoots outta you one of these day’s 😉 I meet my prego client and her hubby this Tues!